Find our tips on all the Champions League matches and all the information you need to bet on the Champions League. The Champions League - or Champions League - is the most beautiful of all European competitions. Each season, it sees the best teams from Europe compete, who have earned their tickets thanks to their respective results on the national stage. For example, for France, the champion and 2nd place, and the club ranked third goes through barrages to get his sesame. The running of the finals is simple, eight groups of four teams are drawn, and the formations of the same pool meet at least once in home and away matches. At the end of the six days of this group phase, the first two are qualified for the round of 16, the third are qualified for the Europa League and the last are eliminated. Then follows a phase of knockout in round-trip meetings, until the final in the month of May which crowns the champion of Europe. Last year, as in 2016 and 2017, Real Madrid was crowned in the Champions. Claim your bonus to bet on the 2018/19 Champions League! What we will remember above all for the Champions League is that it is very prolific! Last year, for example, 3.21 goals per game were scored on average throughout the competition, better than in the previous edition during which 3.12 goals were scored per game. Let it be said, if you want to win your bets on the competition it will be necessary to bet on goals in the Champions League! The other important information for the Champions League is the number of victories at home. Last year, and the figures are similar for the past five seasons, nearly a match in two ended with a success of the locals (44%), against less than 30% of wins away . If you are unsure of an uncertain meeting, then lean more towards a home team success. The rating will certainly be lower, but the probabilities of much higher earnings, and that is what counts to be profitable in the long run. Then, and this goes back to what we mentioned earlier, this competition is without a doubt one of the most spectacular competitions in the world, either in terms of play or goals scored. Know that nearly six games out of ten have had +2.5 goals in the past season, and the figure skyrockets to 7 out of 10 in the final phase! The odds of bookmakers being often beautiful, we do not hesitate to combine several over the Champions League. Even an average bet of £10 can pay big! Do not forget for the season 2018-2019. On the contrary, if you are fond of betting on exact scores we advise you to limit your bets on the competition. In the Champions League more than elsewhere, the results are very heterogeneous and vary enormously from one group to another. However if you want to try it know that last year 17% of matches ended on a 1-2, the largest ratio of the competition with the "0-2". Difficult to bet on this kind of market so, turn rather towards the bet "Goal of the visitors", validated in 60% of the meetings during the last exercise. Another key stat in the Champions League, the goals after the hour of play. In the Champions League more than in any other competition, it is the interval 60'-75 'which is indeed the most spectacular with 25 % of total goals last year. A huge ratio - a goal in four - which is explained by the fact that the teams play for everything in the last moments of the meetings. The odds for a goal in this slice of game often running between 2/3, go for it! Expert advice. Finally, for your prediction on the Champions League, it will be necessary to take into account that last year, during the final phase, 58% of the teams that received the second leg have qualified for the next round, ie almost 6 cases. 10. When the football experts say that receiving the return match is a chance, their word is rather reliable. 2018/19 Champions League: a Great Opportunity to start to bet! After having discussed the statistical part, which should give you some indications for your bets, let's talk now about the unavoidable stages to realize before placing your bet on the Champions League. Already, it will of course be necessary to analyze the shape of the teams, and especially that of the executive players present on the pitch. For example, last year when he wore the colours of Real Madrid, Cristiano Ronaldo could do it all on his own for Casa Blanca, evidenced by his huge ratio of 1.16 goals / match in the competition for 5 years. If stars such as Lionel Messi, Neymar or Mohamed Salah do not shine in recent weeks with their clubs, it will be necessary to think twice before betting. In the same vein, watching injured and suspended players will also be important before predicting a Champions League match. If a major player (eg Sergio Ramos at Real Madrid) is unavailable for a game against a big opponent, it could obviously weigh on the final result of a match, regardless of the stage of the competition. Then, of course, it will be necessary to take into account the real interest of the meeting. For example, if a favourite team has already qualified for the round of 16 in the pool phase, and its underdog opponent plays its qualifying ticket, it may be necessary to favor a bet on the latter, more interesting than the first one. who could turn his staff. Same reasoning for the knockout phase. If a team beat their opponent 6-0 in the first leg, we will avoid playing on their return win. Finally, it will of course compare the odds on the Champions League before placing your bets on the competition. You are not unfamiliar, sports betting sites usually offer different odds for similar bets. To ensure the best potential gains, you will need to increase the number of bookmakers, to take advantage of the best values offered on the bet of your choice. On an average meeting of the Champions League, Bet365 may for example offer a score of 2 on a victory of PSG against Bayern Munich, where William Hill will offer 3/2. In the long run, your winnings on the competition will inevitably be impacted. Bet on 2018/19 Champions League matches! Beyond the games themselves, know that you will also have the opportunity to bet on different groups of the competition each season. In the program for example, you can bet on the teams that will qualify in the round of 16 of this Champions League edition, as soon as the qualifying phase begins..
To succeed your sports bets of the kind, various parameters will be there also to take into account. In addition to the value of the teams present in the group, or their history in the competition, it will be necessary for example to look carefully at the complete schedule of meetings. Thus, if a formation meets a direct competitor at home on the last day (ex: Munich who meets Liverpool at home on the sixth day), it may be necessary to focus on their qualification in the final 8, or even their place of final leader. Bet on 2018/19 Champions League Groups Now! After all of the twists and shocks that occurred in the Quarter Finals, we now have our line up for the next round of the competition. The Champions League will return on April 30th and May 1st for the Semi-Finals, which are set to be explosive. Between Barcelona-Liverpool, a fixture that has football fans already watering at the mouth, and Tottenham-Ajax, two teams that suprised us all with their advancement, this year's penultimate CL round is set to be thrilling, and especially interesting for your predictions. Don't hesitate to register at all of the best bookmakers, to ensure that you can enjoy the most favourable odds on this last Champions League Knockout Phase. For the Semi Finals of the Champions League, you can find full odds values on each match at Bet365 - probably one of the best sites of the moment to place your bets on the tournament of European heavyweights that is the Champions League. Bet on the last 16 of 2018/19 Champions League Now! Another market that is often praised by bettors, the top scorer in the Champions League. Each year, the various online betting sites offer odds on the individual who will finish top scorer of the competition, for the duration of the tournament. A type of bet that is also very popular, since the amount of money achievable through the best bonus as well as the odds are pretty crazy. If you want to try your luck, you will of course have to take into account the ability of your chosen player to score in this Champions League in recent seasons, the tactics adopted by his team (attack orientated versus defensive), And the number of games potentially contested by the latter. Indeed, if on paper Messi is less likely than Lukaku to score more goals, it may be necessary to favour the first rather than the second as Barcelona are more likely to play more games than Manchester United in the tournament. Bet on 2018/19 Champions Top Scorer! After the elimination of heavyweights like Real Madrid, Juventus and Manchester City, Barcelona are obviously one of the main favorites to be crowned champions next June at the Wanda Metropolitano. 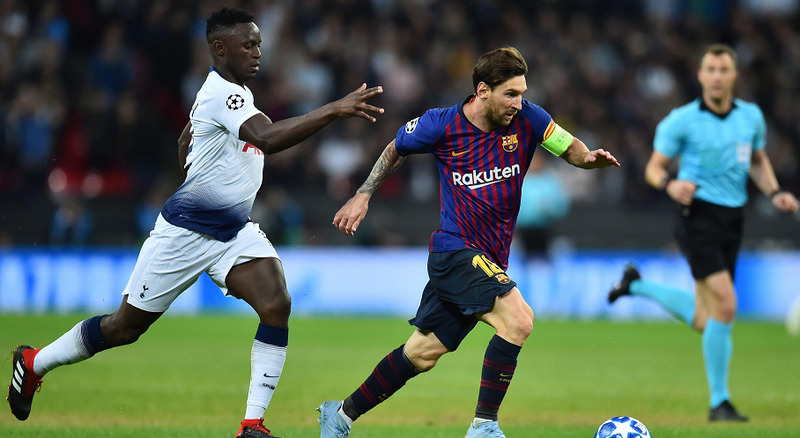 If they manage to beat the other major favourites - Liverpool - it seems that the Catalans will indeed able to overcome Tottenham or Ajax in the final. With Lionel Messi still at his best, and a strong defense led by Gerard Pique, it seems that Barca have all they need to become the Champions of this year's competition. If you're choosing a betting strategy for the winner of the Champions League, this could be the one to take. Bet on 2018-2019 Champions League now!